The ocean off Southern California is a prairie. A free roaming range like the plains of Africa. Home to animals so beautiful they should be treasured like a living, breathing, moving Yosemite. But how can we protect what we don’t even know is there? Many people, even locals who have lived here all their lives, don’t know about the thousands of dolphins or the huge whales that are seen all year round. We hope guests walk away with a new appreciation for the marine life off the coast. And an understanding of the dangers these animals face and steps they can take to help protect them. Capt. Dave's Dolphin & Whale Watching Safari offers eco-friendly whale watching tours with award winning customer service. Fun and educational for ALL ages! Multiple unique and uncrowded vessels include a catamaran sailboat with two Eye-to-Eye Underwater Viewing Pods and an upscale high-speed zodiac catamaran. Captain Dave is a marine naturalist, passionate conservationist, photographer, award winning filmmaker and author, and whale watching captain. A founder of Orange County’s first whale disentanglement group, Captain Dave was a guest on The Ellen DeGeneres Show to raise awareness of bycatch from fishing gear entanglement. He is often called upon as an authority on wild dolphins and whales, and was a keynote speaker at the LA Drone Expo for his spectacular use of drones to film whales and dolphins in his acclaimed video “Drones Over Dolphin Stampede and Whales off Dana Point and Maui”. Videos and photographs from Captain Dave’s safaris have been featured on ABC’s Good Morning America, CBS This Morning, NBC Nightly News, and The Today Show, Discovery Channel, National Geographic and in feature films including the Academy Award nominated film, Racing Extinction. This PUBLIC trip is available daily, year-round. Adults: $65, Kids (ages 1 - 12): $45. Private charters are also available. Please contact us for custom private charter rates. Bring the kids, family and friends to experience an up-close and personal connection with wild dolphins and whales, aboard the most unique and memorable whale watching excursion in the world! 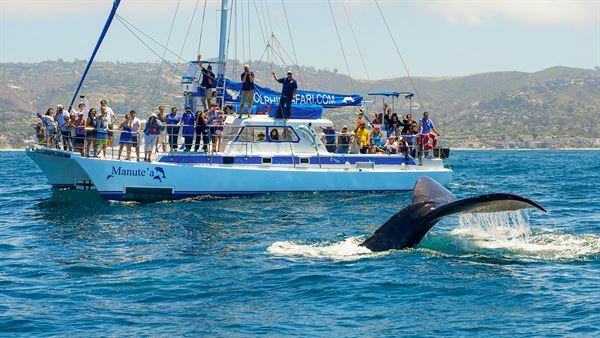 Aboard our immersive whale watching adventure you'll learn about Dana Point's year-round whales, dolphins, sea lions, sharks, pelagic birds, and more. Our 50-foot, high-tech, high-speed catamaran sailboat, Manute’a (pronounced mah-noo-tay-ah) comfortably accommodates up to 49 passengers. Manute'a features two Underwater Viewing Pods that give you the extraordinary experience of feeling what it's like to swim with dolphins and whales, underwater, without getting wet! Live narration from marine naturalists explain how these animals live for an ocean adventure that is both fun and educational for ALL ages.